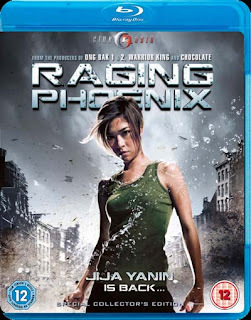 As mentioned in last week's post about the Singapore DVD, Jija Yanin's sophomore action effort Raging Phoenix is being released in the U.K. The date is now set for April 12. Amazon.co.uk has a page ready. No details about special features yet, but DVD Active has huge images of the DVD and Blu-ray covers as well as the U.K. trailer. There is something wrong with movie duration on Amazon. Run Time: 148 minutes (original duration is about 1h 49m or 109 min). I think it's little misprint. Or maybe it's a directors cut? Perhaps that's the total running time of everything on the DVD, including special features?